SELECTRIC Selectric® Electrified Mortise Locksets are designed for the access control of openings in commercial, industrial and institutional facilities where code compliance, dependable operation and resistance to physical abuse is required. Selectric® locksets ensure that the door stays latched even when unlocked, maintaining fire door integrity. SELECTRICTM locksets comply with all national building and fire life safety code require-ments for use on fire rated doors, including high rise stairwell and elevator lobby doors where the use of electric strikes and magnetic locks is prohibited. Z7870 SDC Brand Locksets 7800 with manual deadbolt (High Security Application); Locked Outside only. Failsafe. Deadbolt projected by Key Cylinder or Thumbturn. Outside lever retracts Deadbolt when electrically unlocked. 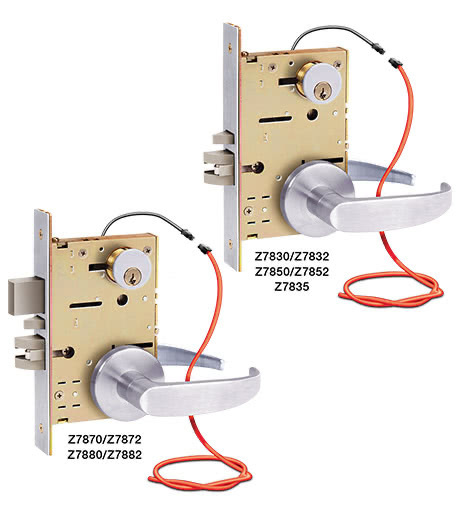 Z7872 SDC Brand Locksets with manual deadbolt (High Security Application); Locked Outside only. Failsecure. Deadbolt projected by Key Cylinder or Thumbturn. Outside lever retracts Deadbolt when electrically unlocked. Z7880 SDC Brand Locksets 7800 with manual deadbolt (Privacy Application); Locked Outside only. Failsafe. Deadbolt projected by Key Cylinder or Thumbturn. Throwing Deadbolt locks out electric operation of outside lever. Z7882 SDC Brand Locksets 7800 with manual deadbolt (Privacy Application); Locked Outside only. Failsecure. Deadbolt projected by Key Cylinder or Thumbturn. Throwing Deadbolt locks out electric operation of outside lever.